Stretching before and/or after workouts is often overlooked but is crucial for proper muscle growth and flexibility. The Waist & Ab Stretcher allows for a deeper stretch than free form stretching. When done regularly, stretching can increase range of motion to help decrease the risk of injury. Can help relieve stress, pain or fatigue on back, abs, and hamstrings. Stretching increases range of motion preventing injuries of joins and limbs. Helps reduce muscle soreness and increases workout recovery. Proper stretching can help relax vertebrae and spinal disks. The state of the art finishing process used on the fitness machine combines the application of an 'Electrocoat Zinc Rich Primer' with a durable polyester powder-coat top layer to ensure every crevice and joint is completely sealed, providing full protection against	corrosion and weathering. Fitness machines are finished in either a gloss or textured polyester powder-coat finish. 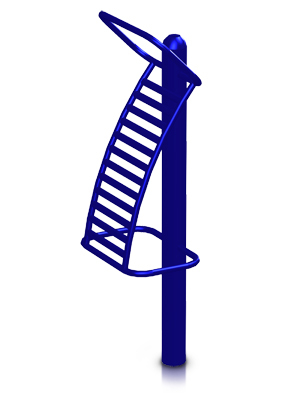 To use, stand with back to the curved rack and reach up to grasp the upper hand hold. Using your abdominal muscles, slowly raise knees or extended legs as high as possible. Hold, and then return to starting position.